Successful long-range shooting demands very uniform ammo. Weighing charges carefully can make shot velocities more uniform within a shot string. Uniformity of velocities is good, because lower ES translates to less vertical dispersion of the shots at long range. Many competitive shooters today try to load charges that are consistent within one-tenth of a grain. Some exacting reloaders, in the relentless pursuit of perfection, go even further — they try to maintain charge weight uniformity down to the equivalent of just one or two kernels of powder. To weigh charges with this kind of precision, you need a very high-quality scale. Even the $400.00-grade balances (such as the Acculab VIC-123), struggle to maintain single-kernel precision with their conventional strain-gauge load cell technology. But there is a new class of electronic lab scales which employ magnetic force restoration technology. These force restoration balances can reliably (and repeatably) weigh a single grain of powder. In normal use, lab-grade force restoration scales also deliver a stable reading more quickly than strain-gauge type scales. This is a boon for reloaders who like to trickle the final few kernels of a load. But the enhanced speed and precision of force restoration (magnetic) scales come with a stiff price — these technological marvels cost $900.00 and up. That could buy a custom action, or three new barrels. Do the advanced force restoration scales perform as advertised? Can they reliably recognize a single kernel of powder quickly enough to make trickling practical? Well, thanks to Forum member A.J. (aka AJ), we have a video that answers those questions. Using a Sartorius GD503 Class II force restoration balance with an Omega two-speed powder trickler, A.J. demonstrates how he can weigh charges that are consistent within a single kernel’s weight, i.e. 20-25 thousandths of a grain. When you watch the video, note how (at 3:45 time mark) the RCBS electronic scale reads 41.7 grains, when in fact the correct charge weight was 41.830 grains, as measured by the GB503. That’s a one-tenth grain (four kernel) error right there. You will also see that the Omega Trickler from Dandy Products really can drop one kernel at a time. It takes some careful adjusting of the drop tube to achieve this sensitivity, but the Omega really is up to the task. 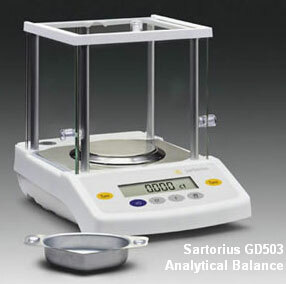 If you’re interested in the Sartorius GD503, below is a video from Balances.com that explains the features of the GD503 and shows how to set up and operate the unit to achieve the best results. This final video also shows the difference in performance between a strain gauge scale and magnetic force restoration scale (GD503). In the video, both scales are tasked with measuring tiny grains of salt, which are much smaller than extruded powder kernels. You can see that the GD503 responds more quickly when a few grains of salt are added.